It is not common for research completed during undergraduate studies to turn into a published academic paper. It is even less common to be first or second author on that paper. And it is really, really uncommon for that research to potentially contribute to the treatment of a terrible group of diseases. This, however, is what has happened with Aaron Robertson and Kyle Schaltz, former students of Laurier Associate Professor Allison McDonald. When they were fourth-year Laurier students, Robertson and Schaltz worked in McDonald’s lab in the Department of Biology. The research was also part of their undergraduate honours theses. It took a while, as often happens with academic journals, but their paper, on which they are respectively first and second authors, was published in the Journal of Bioenergetics and Biomembranes in the fall. Karina Neimanis, who was a master’s student of McDonald’s during the project, is the third author, ahead of McDonald. The team’s research has to do with taking a protein called alternative oxidase from oysters and putting it into yeast – specifically, into their mitochondria, which are the energy production powerhouses of cells. Yeasts do not normally contain this protein, so it amounts to gene therapy. Though yeast may seem far removed from humans, neither human nor yeast cells naturally contain alternative oxidase. Also, yeasts make protein in much the same way as humans do, says Robertson. "That’s the lure of science – discovering new things." In humans, there are four protein complexes in mitochondria, complexes one to four. McDonald suggests thinking of them as four workers in an assembly line. When all are working well, the product is made efficiently. However, when one “worker” has a hangover, the line slows down and becomes error-prone. Things get even worse when any of the workers is completely out of commission. Similarly, when any of the four protein complexes aren’t working in humans, people get mitochondrial diseases. Though mitochondrial diseases can vary from mild to severe, symptoms can include slow growth, problems with muscle coordination or weakness, cognitive disabilities and organ failure. It is currently incurable and can be fatal – especially in children. There are also links between mitochondrial problems and neurodegenerative diseases such as Huntington’s and Alzheimer’s. The research produced by McDonald’s team may be a first step toward treating these diseases. The recently published paper is the result of a whopping six years of laboratory work – and the roots of the project trace back even further. McDonald started researching yeast when she was a fourth-year undergraduate and continued similar work for her master’s. When she was completing her PhD, she was the first in the world to discover that alternative oxidase, a protein previously thought to exist only in plants, also existed in a number of animals, including oysters. “That’s the lure of science – discovering new things,” she says. 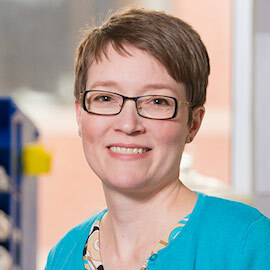 McDonald started trying to put alternative oxidase in yeast in 2010, when she was a postdoctoral fellow at Western University, but literally put the project on ice when she started her faculty position at Laurier later that year. Schaltz restarted the research in 2011 and was able to determine that the oyster protein was still present and functional in the yeast. Robertson, initially with Schaltz, then grew the genetically altered yeast in cyanide cultures. Cyanide kills cells because it effectively shuts down “worker number four,” says McDonald. Her idea was that alternative oxidase – acting as a “sneaky worker number five” – should be able to pick up the slack. The result of Robertson and Schaltz’s lab work? The yeasts with the oyster protein grew much better in the cyanide than the regular yeasts. “We were very surprised,” says Robertson. Though the research is still a long way from human trials, it is an important step toward developing gene therapies for people with mitochondrial diseases. “If we have someone who has a disease and it’s caused by a problem with worker three or worker four, what we might be able to do is put alternative oxidase, worker five, into that system, and solve part of the problem,” says McDonald. McDonald says her former students are the first authors on the paper because they did the bulk of the experiments and contributed significantly to the analysis and writing. They were also a lot of fun to work with, she says. Robertson says McDonald always “went the extra mile” for him and taught him “how to persevere through the tough times” when things went wrong. Though the technical work he does now is different from what he did in McDonald’s lab, Robertson says he uses the life skills he learned from her every day.